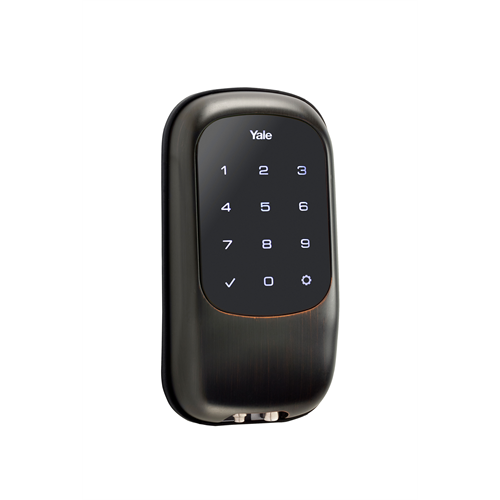 Add a touch of class and automation with the new Yale Key Free, Touch Screen Zwave deadbolt. This new design allows for a much more sleek appearance, smaller size and there is now keyway to pick or bump for enhanced security. Use the Yale Zwave lock with a Zwave controller (not included) to enable enhanced features such as getting email notifications when family members, friends or workers unlock the door as well as both checking lock status and locking/unlocking remotely or on schedule. The fully motorized, tapered deadbolt design allows it to reliably lock or unlock when used at the keypad or remotely. Grade 2 certified for high quality. The lock operates on 4 AA batteries with low battery warning. If the low battery warning is ignored and the batteries expire, a convenient 9V connection at the bottom allows the owner to temporarily provide power so a code can be entered to unlock the door (security is not bypassed). Don't forget to add batteries to your order. Door Thickness: 1 3/8" to 2"